There are quite a few Detroit techno kids out there now—the 313 offspring are starting to come out. Juan Atkins told me that he’s teaching his daughter how to DJ, and I spoke to Lou from Scan 7, whose son is now DJing and producing, too. At this year’s Movement Detroit Festival, I talked to Kevin Saunderson about being a dad and having your kid follow in your footsteps. My daughter, Lyric, was exposed to this music from a very young age—even before she was born. I remember when I played in London and my wife was pregnant with Lyric. She was with me standing in this warehouse with this heavy music reverberating through the room. So Lyric surely felt it in the womb, too. When she was 9 or 10 years old, she introduced me on the microphone at I Love Techno in Belgium. I was ready to start, and one of the stage engineers suggested letting her go out first to introduce me to the crowd—and that’s what she did. That was her first exposure to a huge festival. She kinda grew up in this. I guess that’s one of the reasons why she has such an intuitive understanding of this music. She just turned 21, and apart from being on tour with me she doesn’t have that much firsthand experience with club culture so far. My wife and I noticed Lyric’s love for music really early on. As time progressed, she started to show an interest in DJing and maybe even making beats. One day, I asked her how she felt about coming into the studio with me and DJing for a bit. I wanted to see if she had an ear for it. She caught on right away. But did she really have the desire to do this, to pursue this as a career? A lot of people really like music, but they don’t love it and don’t have the passion to dig deep. Watching Lyric, I was convinced pretty quickly that she had the work ethic and the commitment it takes to pursue it. So my wife and I bought her one of these DJ mixer and controller packages after Lyric DJed at her own sweet sixteen party. Watching her do her thing then was incredible. She started to make mash-ups of her favorite tracks in her room with the gear we bought her. For her first one she took a beat from Skrillex and a vocal from Lady Gaga, if I remember correctly. From there I saw her musical taste develop in fast forward. I tried to step back as much as possible and let her figure out the history of the music for herself, though. I was curious to see what she would discover by digging on the internet, what artists and eras would speak to her. Every once in a while she’d come to me and say “Daddy, I found this track from MK; I found this track by Kevin Saunderson; I found music from Frankie Knuckles.” Once she had a basic knowledge of the heritage of house and techno, I got active and filled the blanks a bit, giving her the bigger picture of the Detroit sound or the Chicago sound. She loved that. She was still a teenager back then, so at that time she was also into Katy Perry, Martin Garrix, Lady Gaga, Ariana Grande, Justin Bieber. Seeing her balancing all these very different artists and styles reminded me of myself. When I was her age I was into a lot of different stuff as well. I was into Stevie Wonder, Depeche Mode, The Specials, A Tribe Called Quest and so forth. For me it’s really important that she knows what the Motown sound is, what rock ‘n’ roll and hip-hop are and how important those genres are—no matter if she’s planning to work in the industry or not. At the same time I want her to find her own way and for her not to get programmed by me at an early age. She should maintain her own sense of wonder. I am acutely aware not to guide her in any direction without her specifically asking me about it. The other day I was driving to a gig and Deee-Lite’s “Groove Is In The Heart” came on the radio. It took me back in time. Q-Tip is on that record, and Bootsy Collins is on it, too. It changed the game back then; you had all these different influences going on, from funk to hip-hop to soul and disco. It was like a disco ball of expression. That, to me, is what Lyric is. That track embodies her mindset and spirit. She’s pure. She’s coming in with a new energy, a new way of looking at things. It’s very exciting to see this untapped passion and energy and what it develops into. The first time we ever played together publicly was at Movement in Detroit a few years ago. I told her beforehand that she was free to do whatever she wanted, whether it was playing EDM, acid or techno. So she played Beyoncé, she played Martin Garrix and she played Katy Perry—right in the middle of my live set. I loved it. Granted, it caught quite a few people in the audience off-guard and probably confused some of them, but I knew that was gonna happen. We are so programmed sometimes—especially when it comes to house and techno. A lot of people have these purist ideals these days. They only like it a certain way. I thought it would be interesting to see what would happen. I never understood why music should be segregated. After that first set, the idea to work together on music under the Floorplan moniker happened pretty much instantly. We bought her an MPC to play around with. It was and still is mesmerizing for me to watch Lyric getting the hang of working with electronic music gear and how quickly she gravitates to it. Sometimes she programs a beat on her own and then she brings it to me and we rework it a little bit together, and then we add keys to it. She really likes basslines. A lot of the time we slow the raw beat down to maybe 103 BPM and then she taps or plays the bassline she has in mind. She’s very inspired by MK and Todd Terry at the moment. Once we have the whole groove, we start to add vocals. We’re pretty much making songs together on a daily basis. If needed, I later clean those raw ideas up a little bit. But that’s happening less often. Take “Music” from one of our last Floorplan EPs, for instance; she came up with the bassline and the drum patterns. I had very little to do. My philosophy is and always has been that too many choices will end up confusing you, so I tell myself, “Keep it simple, stupid. Use what is essential and important to you.” That’s what I tell Lyric, too. You don’t need the newest gear. If you’re always on the lookout for the new, hip gadget, you’ll get oversaturated and eventually it will only slow you down. I think so far she fully subscribes to that philosophy: less is more. And, as Jeff Mills said to me when I was just starting to produce, “You know when the cake is ready.” You just have to establish that knowledge—that connection to your soul. At times it was tricky to leave myself and what I like out of this process as much as possible. I gave her some techniques. But I wanted her own ideas of how to program beats to fully come out and bloom, too. It’s hard for me sometimes not to step in, though. So every once in a while I leave the room to let her do her thing. I’m the same way; I like to be left alone sometimes to work out some ideas. Lyric really made me step up my game. She made me pay closer attention to what I produce and what I put out. These days, she’s sort of the A&R of M-Plant Records. She’s become the go-to person for me to say yes or no to a track. If she doesn’t play it in her sets, I question if I’m even going to release it. She lets me know right away if something is for her or not. She’s my fresh pair of ears. It’s amazing to see her grow. She has come a very long way in a very short time. It’s very inspiring to see that. She’s fresh water on this musical landscape. She has also reminded me of the importance of taking calculated risks. Compared to her, I was late in the game. I was a graphic artist at first. With Underground Resistance, the thing for me was not to rush—to be able to hold my own sword and carry the name. I remember once when Jeff Mills stepped away from the turntables and I took over. It sounded like galloping horses. It was a mess—I thought I was ready and I wasn’t. So I know that things take a while. I learned a lot about patience working with UR, and that’s what gave me strength. It doesn’t help if you’re in a rush. That’s the same process I’m taking my daughter through at the moment. Take your time. You don’t want to crash and burn at a young age after being the flavor of the month for a bit. Or maybe she decides on her own that the music industry or DJing ultimately is not for her. But at least if she does decide to stay in it, she’s standing on a solid rock. Her ascent has happened a lot faster than most, though. To be honest, I’m trying to keep it at a slow pace, but it’s not easy. I mean, a little while ago she played Coachella with me. It’s just such a fast-moving train at the moment, and a lot of that is due to her. When she came into Floorplan, the ball started rolling so much faster, and it’s hard for me to jump off this fast moving train—to get off of it, to take a look at it, assess it and see what’s actually going on. It’s amazing how fast she came up in this thing we call techno and house. I’m really interested to see where she’ll be in five years. I am a proudly over-protective father—always have been, always will be. And my wife is the same. We’re shielding and guiding her, knowing that she has to make her own experiences and her own mistakes. We’ve always been really hands-on with her, and now, slowly, the time to be more hands-off is coming. There are a lot of temptations out there in the world—especially in nightlife. But she has to make her own decisions and choices. I wouldn’t let her tour on her own just yet. I would be in the background, in the shadows, watching her. You know, that’s my baby. When the time is right and she still wants to I’ll let her do it all on her own. It’s coming. And I will have to face reality. 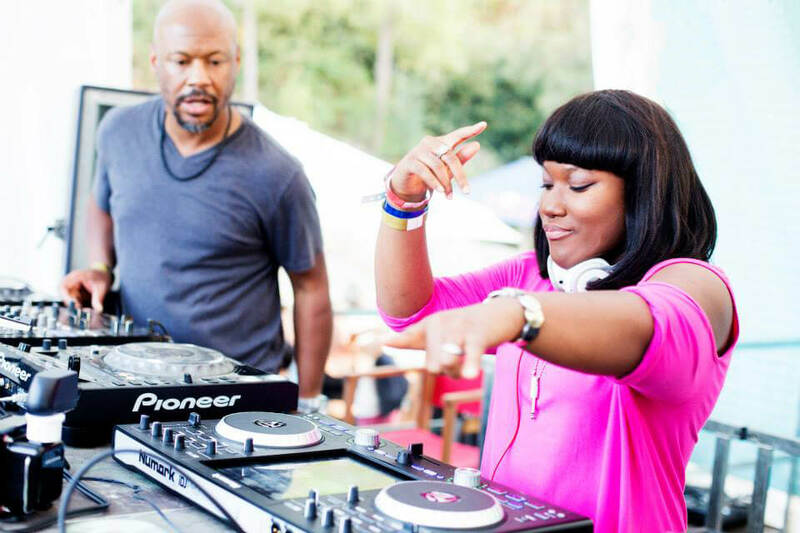 Robert Hood will play on the Telekom Electronic Beats Stage at Audioriver Festival in Płock, Poland, this weekend. Read more Mentors columns with Stacey Pullen, Kevin Saunderson and more here.